There are moments in life that we'd like to capture forever. In those moments, we may snap a photo on our mobile phone to share with friends. Unfortunately, what we often get is a small blurry picture overly compressed by a destructive JPEG algorithm. Wouldn't it be nice to be able to record pictures without loss of details? 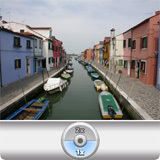 Photos HQ is an application that lets you capture photographs of much higher quality than those created by the default camera software of your mobile phone. Photos HQ enhances the capture capabilities of devices with an VGA (640x480) camera and increases the resolution to 960x720 pixels by combining two consecutive images. In order to limit the loss of information, Photos HQ can record pictures as a lossless BMP file. With the optional pnoJpegLib, it can generate compressed pictures of a higher quality level than the standard JPEG algorithm. Additionally, Photos HQ brings new features such as an improved digital zoom, a 10 seconds self-timer, and a picture-in-picture thumbnail showing the preceding photograph. Using your desktop computer, download Photos HQ. If the file you download is compressed, you need to decompress it. 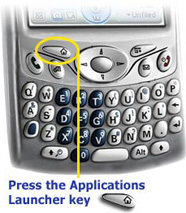 Double-click the Palm OS (.prc) file. An Install Tool window opens. If asked, choose the device to which you want to install the file (if you have only one device, you may not see this window). The main Install Tool window opens. If you want to install additional files, just drag and drop them into the Install Tool window. (optional) If your device includes an SD/MMC expansion slot, highlight the application in the file list, and click Change Destination to select the location where it will be installed. Then click OK or Done. Click Done. Perform a HotSync operation to transfer the application to your device. The Applications Launcher is the "home" screen on your device. It's the place from which you can open any application. To open Photos HQ from the Applications Launcher, simply tap on the application's icon in the launcher. It's off-screen. Use the scroll buttons along the side to scroll down the screen. Applications are arranged on the page alphabetically. You don't have the "All" category selected from the pulldown menu in the upper right corner of your screen. 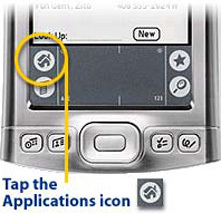 Use your stylus to tap on the down-arrow in the upper right corner of your screen, and select All. You need to register to remove limitations like watermarks. In order to promote the Palm community, Photos HQ is available at a very low price. Please support shareware applications! The original camera has a basic digital zoom allowing only two positions: standard x1 and zoom x2. Zoom x2 uses the "nearest neighbour" algorithm which removed one line and one column out of every two by increasing the size of the pixels. Photos HQ enhances the zoom performances and flexibility by using the "bicubic" algorithm which allows both an image of better quality and the ability to select several intermediate zoom factors between x1 and x2. There is an option in the application's menu to disable the "bicubic" algorithm and revert to the "nearest neighbour" algorithm if desired. Note: The "bicubic" algorithm is frequently used for scaling images and video for display. It preserves fine detail better than the predominant "bilinear" algorithm. The simplest method is known as "nearest neighbour" or "point sampling", "nearest neighbour" can be used when interpolation speed is critical, if not, bicubic interpolation is a better alternative. For a summary and further references, you can take a look at Wikipedia for Bicubic_interpolation and Resampling. The exposure is the amount of light received by the sensor. The exposure can be represented by its exposure value "EV", a high EV indicates bright conditions. In automatic mode, the camera determines the optimal settings based on the exposure value determined by the light metering system. The camera's metering system will sometimes determine the wrong exposure value needed to correctly expose the image. This can be corrected by the "EV Compensation" feature: press Right or Left. Have you ever wanted to take a photo of yourself with your friends? Photos HQ has an optional 10 seconds self-timer which you can enable from the menu: prop up your device to aim at the desired location, start the timer, and you have 10 seconds to position yourself in front of the camera. The screen of your device flickers during the countdown, and a signal sounds when the photo is captured. Being a fly on the wall no longer requires multiple components or tricky wiring! Surveillance mode is an optional motion detection feature that monitors your home, office or any premise. Whether it's for the office, the baby's nursery or the warehouse, Photos HQ records action triggered by motion as it happens for added security and ultimate control. Physically adjust the device to face the area you want to monitor, and at power off you'll turn your handheld to an inexpensive surveillance system. Keep in mind that the camera will still be on all of the time in stealth mode, even if the display is turned off. Photos HQ enhances the capture capabilities of VGA (640x480) cameras by combining two consecutive images (captured simultaneously) into a finer 960x720 picture. Because of the delay introduced by the hardware between the two consecutive images, the mechanism of interpolation ideally requires a steady hand while taking photos. To remove artifacts caused by accidental movement, Photos HQ has a motion detection algorithm which can be disabled by unchecking the option in the application's menu. In order to try out the motion detection algorithm, simultaneously press the Shift and D keys. 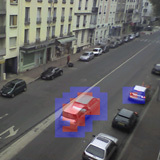 This option shows the areas in which a moving object was detected by the algorithm as embossed on the captured image. It's always important to ensure a quality photograph whenever possible. In order to increase safety for the user, the interpolated high resolution photo is always accompanied by the original, i.e. the first of the two photographs captured in native resolution. The interpolation mechanism makes calculations on 24 bits and the interpolated images are stored in BMP format to prevent introducing the additional noise inherent to any compressed JPEG format. Note: A system limitation on older models prevents the pnoJpegLib library from creating a file larger than 61K. Photos HQ detects the capabilities of your device and determines the maximum allowed quality for that device. The JPEG format reduces the amount of storage space required by a photo. The adjustable compression ratio makes it possible to choose between the quality of a picture and the size of the file containing that picture. While device design and the capacities and cost of storage media have improved, it is still often not possible to store a picture in a format that preserves all the original details. In order to compress the photographs and at the same time maintain a satisfying quality, Photos HQ can use the optional pnoJpegLib library. If not, Photos HQ will use the internal PalmPhotoLib library if available on your device. Photos HQ records your photographs either in internal memory or on the memory card inserted in your device. Photos HQ records the data in the directories used by the default camera software of your device, allowing you to view and use the pictures captured by Photos HQ the same way you would with your usual application. Please refer to your device's documentation for more details on viewing and managing pictures. Press Applications and select Pics&Videos. Select the album that contains the picture you want to see. Select the picture you want to view. To view an album from an expansion card, insert the card and select the album from the Album list. If the items on the card are not grouped into albums, select the card name from the list. Press Right or Left to scroll to the next item in the album. To see the outer edges of a picture that may not be visible, use the stylus to tap and drag the picture in any direction. Tap the picture or press Center to return to Thumbnail View. In Thumbnail View, you can group photos to more easily locate them. Select one of the grouping options from the View menu. When you synchronize your handheld, your pictures are copied to your desktop computer. You can view pictures in JPEG and BMP formats. You can email them to friends using your desktop email application. 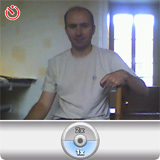 On a Windows computer, you can view and edit synchronized pictures and videos in the Palm Media desktop application. Open Palm Desktop software and click the Media icon. 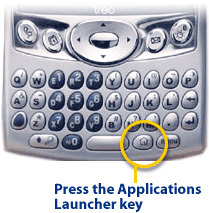 You can refer to the Palm Desktop Online Help for information about using the Palm Media desktop application. Photos HQ is compliant with Palm Powered Solutions Test Application Compliance Testing Version 2.0. Photos HQ should be safe for any PalmOS device, release 3.5 or higher. Nevertheless, if your device is not in the above list, be sure to backup your data before installing Photos HQ. Any compatibility report for a non-listed device will be greatly appreciated and will guarantee your device to be taken into account for further releases. Photos HQ operates on current and probably future devices by detecting dynamically the capacities of each device: maximum size of the photographs, compression JPEG, memory cards, constraints related to the embedded memory. Certain functionalities are not available on old models and the table below summarizes the functionalities for each device. New feature: press the V key to launch "Pics & Video"
Copyright © 2007-2008 J.F.Morreeuw. All rights reserved.